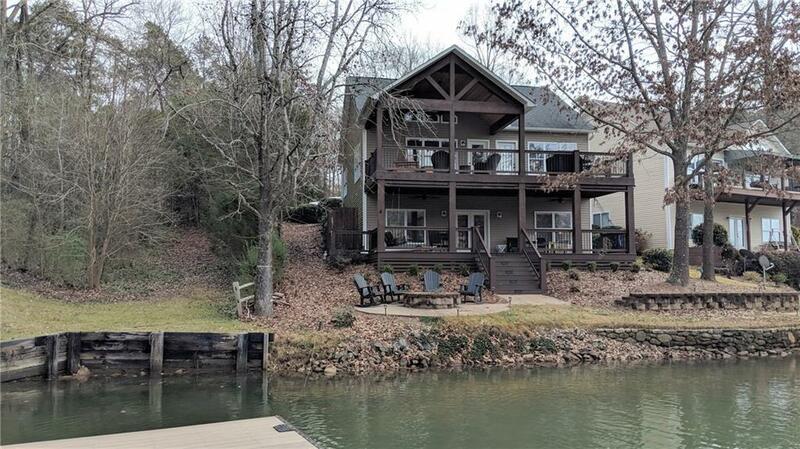 A great get away on Lake Keowee. Deep water and only 30 feet to the lake! Very gentle slope! Welcome to Talco Trail. A great find and not an old home. This house was built in 2008 but not completely finished nor occupied until 2010. The current owners have made many improvements including just recently adding a cedar ceiling in the cedar post deck roof and adding two new trex decks! No carpet as hardwoods replaced any carpeting. A large fire pit and landscape wall are on the lakeside. If you love outdoor space this private get away is a great find! A two car garage and plenty of parking for guest. There are two parking pads and a yard in the front for kids to play. The inside has nice stainless steel appliances that are included with the sale. All of the appliances have been replaced so they are only a few years old. (The washer and dryer do not convey, sorry) Nice dining room area and the living room has a fireplace that warms up the whole house quickly. The kitchen has all the space you need for whipping up any size meal. The master is located on the lakeside of the house for nice lake views but has a private location. A covered deck and lots of other uncovered space on the deck make using the outdoors so convenient you will love it. The downstairs includes a living room, bathroom and three rooms used as bedrooms. The bedrooms are very spacious. The lower level deck has an outdoor shower added to the side for privacy and is enclosed. Only steps to the lake. You must check this one out! No Homeowners Association. This is an unrestricted property. Plat is available.